Five years ago California became the first state in the nation to recognize access to safe, clean drinking water as a human right. Five years later, the reality for hundreds of communities throughout the state is they have tap water that’s too contaminated to drink and no money to clean it up. According to data from the state’s Water Resources Control Board, 700,000 Californians living in nearly 300 mostly rural and economically disadvantaged communities throughout the state have water that doesn’t meet safe drinking water standards. Some have dangerous levels of naturally occurring arsenic or uranium. Others are tainted with nitrates from fertilizer and dairy farm waste runoff. 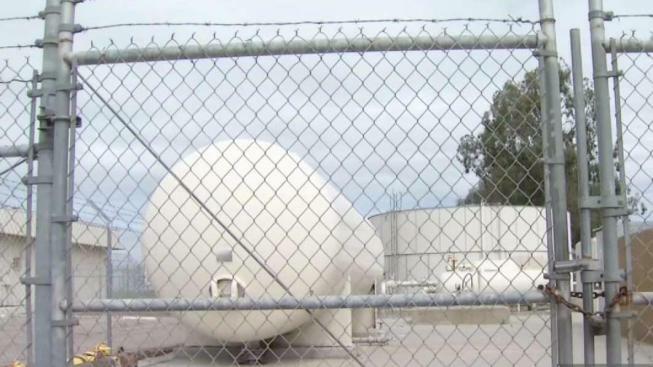 Many of these communities have known about their contaminated water for decades, but an NBC Bay Area investigation found significant barriers preventing them from cleaning it up. For the most part, it comes down to money. Water is controlled locally in California, and hundreds of small water agencies can’t afford to treat contaminants that larger agencies can take care of with relative ease. The state Water Board can provide grant funding to build treatment systems in such communities, but the trouble is many can’t afford to even run such a plant once it’s built. “What we found is that we have a variety of small systems throughout the state, primarily in rural areas in the Central Coast as well as in the Central Valley, who just don’t have the economy of scale to pay for even the operation and maintenance of a modern treatment system,” Felicia Marcus, Chair of the State Water Resources Control Board said in an interview earlier this year. The scope of the crisis gets even larger when factoring in communities with chromium-6 in their water or the nearly 2 million people who draw their water from private wells. Recent testing shows many of those wells are likely contaminated as well. The numbers get even worse when including the 94 public water systems serving 1 million people, that according to state data, have high levels of a newly-regulated chemical known as 1,2,3-TCP, which scientists say can cause cancer and other health problems in humans. 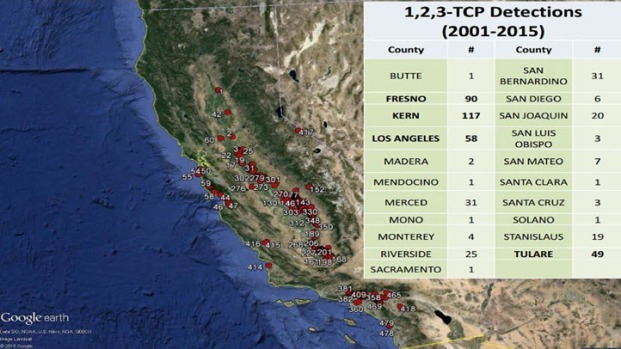 All TCP detections in California wells above the state’s proposed maximum contaminant level, 2001-2015. Marcus said it simply won’t be possible for many of these communities to treat their drinking water without ongoing funding from the state, a solution that would have to come from the legislature. “If the legislature can come up with a way to deal with that, then we’ll be off to the races,” Marcus said. Sen. Bill Monning (D-Carmel), along with an unusual coalition of environmentalists and farmers, says the solution to this problem is Senate Bill 623, which would establish a Safe and Affordable Drinking Water Fund subsidizing the operation and maintenance costs of cleanup efforts in small communities. He introduced the bill earlier this year, but it’s sitting in the House Rules Committee until the legislature is back in session next year. “Unfortunately, it’s a well-kept secret that over a million Californians don’t have access to clean, safe, affordable drinking water,” Monning said. The burden of paying for such a fund would be shared by water customers, farmers and dairy operators. Most water customers would see a $1 dollar fee tacked onto their water bill each month. Farmers and dairies would also pay a small fee each time they purchased fertilizer to help offset the damage to water systems caused by those products. Nowhere, activists say, is the need for such a fund more apparent than the unincorporated community of Lanare, a rural town of about 600 people in East Fresno County. An outsider would pass the barbwire fence and the unremarkable cluster of tanks and pipes at the center of town without much thought. But to the town’s residents, the small water treatment plant is a stinging reminder they’ve been left behind. The plant, completed about a decade ago with $1.3 million of grant funding obtained by the community, was supposed to clean the town’s water, which has some of the highest levels of arsenic in the state. Just six months later, though, it became apparent the community couldn’t afford to operate it. The town was going into debt and the plant was forced to shut down. It sits idle to this day and residents continue to rely on state-funded bottled water that’s trucked in once a month. “Every time you come here there’s a symbolic reminder that $1.3 million is sitting there that could clean your water, that would allow you to open your tap and get a glass of water and drink it without being afraid of getting sick,” said activist Veronica Garibay. Garibay is the co-founder and co-director of Leadership Counsel for Justice and Accountability, a non-profit advocating for equal justice on behalf of rural, low-income communities in the San Joaquin and Eastern Coachella Valleys. Garibay’s organization, along with other environmental groups such as Community Water Center and Clean Water Action, is backing SB 623 in hopes it bill will bring relief to communities like Lanare, where residents feel their calls for help fall on deaf ears. “Even if the community wanted to, we can’t afford to treat the water,” said Isabel Solorio, a Lanare resident who helped create a community group to advocate on the town’s behalf. Meanwhile, the community has moved on from the idea of getting the treatment plant up and running again. The Water Resources Control Board is funding the construction of a new well it hopes will provide clean water to the community by next year.